« The Skills Gap Part Deux: Some Evidence and Who’s Fault is it Anyway? The cost of the recent recession in terms of jobs lost was great, but the longer-term cost could be far greater because of the impact the recession had on NH’s entrepreneurial economy. While small businesses are cited as being responsible for the majority of new job creation, the fact always left out of that truism is that most of the job creation by small businesses come from new businesses, and more specifically, a small number of new businesses that become “gazelles,” new businesses with the potential to grow much larger. Most small business will always be small. They start, they fail, and with a lot of churning they are the businesses with whom we most interact on a daily basis. New Hampshire and New England increasingly have relied on our economy’s ability to generate new and innovative businesses to maintain a dynamic economy, a decline in entrepreneurial activity would have significant implications for our ability to continue to do so. Looking at data on employment by age of businesses in NH from the past decade, it is clear that while NH may have suffered less than most states during the recent recession, it is not so clear that our entrepreneurial economy did as well. 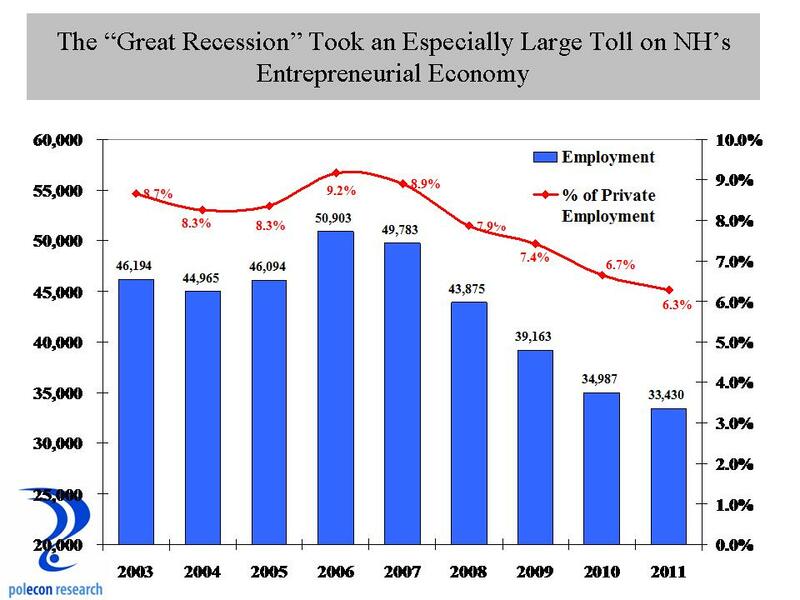 The chart below shows that the recession had an especially large impact on NH’s entrepreneurs, as the the number of people employed at firms operating for three years or less declined by 34% between its peak in 2006, and 2011. As a percentage of private employment, workers at firms three years old or has fallen from over nine percent of private employment to just over six percent. This data does not mean that 16,000 workers in firms three years old or younger actually lost their jobs. Remember, this is time series data so the firms in 2006 that were three years old or younger are not the same firms in the three year old and under category in 2011. Certainly there were substantial job losses among young firms during the recession (as well as some gains) but the data more likely suggests that the next wave of new businesses (some of whom could be expected to become “gazelles”) simply did not start or were not able to survive and grow. For how long those effects lasts should be a question for anyone wondering what to do about the slow pace of job creation in the state. It would be nice to have a control group of data from Massachusetts to examine for comparison purposes but they do not participate in the program from which these data are drawn. Recessions always take a toll on smaller and newer businesses because those businesses are often in more precarious financial positions. The data for NH do not go back earlier than 2003 so it is difficult to say whether this recession was different in its impacts on entrepreneurial activity in NH but we really should be concerned about whether the impact of the recession on entrepreneurial activity will have longer-term impacts on the NH economy. This entry was posted on November 5, 2012 at 8:49 am and is filed under employment, Entrepreneur, Recession. You can subscribe via RSS 2.0 feed to this post's comments.